Pure, natural Australian lake salt enhanced with our unique ionic magnesium bitterns. Returning the solar concentrated bitterns to the salt boosts its magnesium content to 4400ppm. 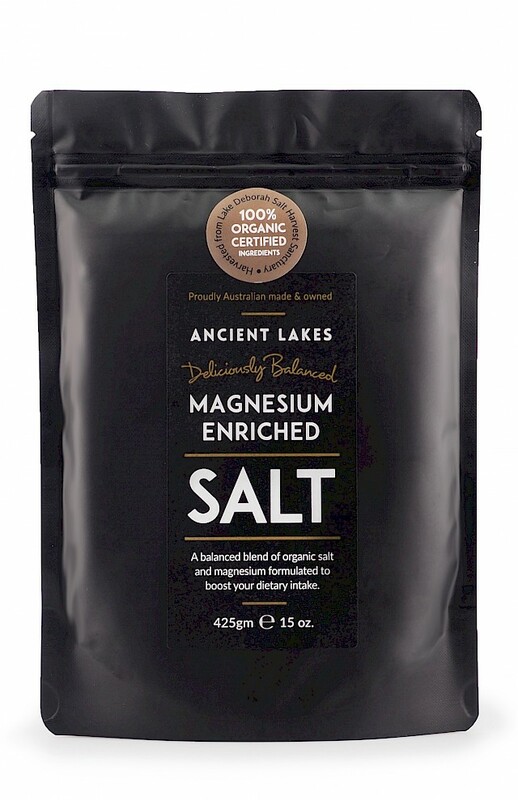 Simply replace ordinary table or cooking salt with Ancient Lakes’ Mineral Balance Salt and increase your dietary magnesium. Mineral Balance Salt is completely natural, sustainable and 100% Western Australian. Fifty times more magnesium than Himalayan Pink salt! Naturally damp – will not clump. This natural culinary salt is perfect sprinkled over food, or added while cooking. Use in place of your regular table salt. Also available in 125 grams. Perfect for your low-carbohydrate lifestyle. The Getting Started Pack is specially formulated to replace macro minerals lost during low-carb transition and allows you to tailor your mineral intake to meet your personal needs. Ancient Lakes Keto Salt is a balanced blend of essential macro minerals to help replace salts lost during exercise, summer heat or for those transitioning to a low-carb or ketogenic diet. Ultra Magnesium Salt is the world’s highest magnesium salt – more than fifty times the magnesium of Himalayan pink salt. I love using your salt every day, especially on eggs cooked any way. Once you have tried this salt you will not go back to the supermarket stuff. It has a unique taste thats complements your meal. Iam a breeder of working dogs and with animal injuries its a frequent occurance. I had a dog with severe injuries and have been bathing with this salt and water twice aday for 6 weeks. My vet is amazed at how well he is healing, Im sure its the Magnesium in the salt. This lovely magnesium salt is a must. Love it! Always on the bench and ready to add to meals! Who knew getting magnesium into your diet was so easy! Thank you! A pinch of salt now means a pinch of magnesium infused salt :) I raise chickens and also at some to their diet. I have two week old chicks at the moment and hubby mentioned he can clearly see the difference in their growth. Very happy with your product. I have been using this magnesium-infused salt for months now and absolutely LOVE it!!! It has a great taste and you only need to sprinkle a small amount on your food. With all the garbage out there touted as "natural", I love knowing where my salt is coming from and that it comes from a lake that is protected! The awesome family that mines, packages and sells these products are simple a bonus! They are online chatting and answering questions, posting pictures of where the products come from and how the process works. I highly recommend these products!!! This is a great tasting salt; you don't need a huge amount, just a light sprinkle and it brings out the most awesome flavours in foods. I keep some at home, at work and am constantly handing out to friends. This salt is the most pure salt I have ever used. It is not necessary to use huge amounts because the salt is so flavoursome in small doses. It's perfect for people with fluid retention, often told to never use salt but some salt is necessary for our bodies, especially thyroid function. While I love every product offered on this site, and I've used every product, aside from the toothpaste which has only just become available. For me, the salt is both delicious and healthful. I'm a fan for life of these products. I love the taste of this salt.And I always carry a little pouch of magnesium infused salt.I highly recommend it,you gotta try it to believe it.Great tasting salt. Absolutely the best tasting salt. I am going to buy myself a "take your own" container so when I eat out I have to hand the salt I want. This salt tastes great. Am looking forward to trying some of their other products, particularity since they are as natural as possible. My research seems to indicate this isn't the case for most magnesium based products. Well done Ancient Lakes!